Above image color will not be accurate (again) if you view it via other web browsers without color management support but you get the idea. This should be a must for any photographers or frequent visitor to photo sites such as flickr. One little (Mac only?) 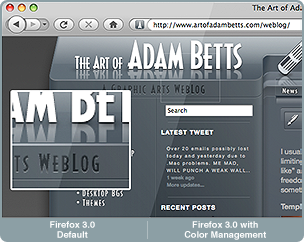 bug: it also color manage the entire window color, rendering all elements (titlebar, buttons, etc.) slightly darker. D’oh! Hmmm, Mobile Safari must not have such features (like the desktop version does) I see that image as lacking color and not the blue I normally see on my computer(s). The reason for it rendering the whole window (chrome and all) differently, is because the interface in Firefox is built using PNG images and rendered by Gecko. So the interface is rendered in exactly the same manner as a web page within the browser.